Manchester United FC took the lead for the Champions League's Quarter Finals match. 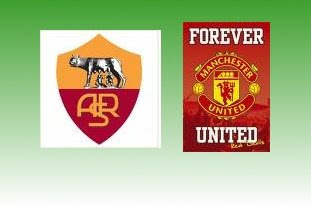 Manchester United FC defeated AS Roma with a score of 0-2 on April 1, 2008 at Stadio Olimpico, Rome for the Champions quarter finals' first leg match. Manchester United took the lead (0-1) at the 39th minute when Christiano Ronaldo received Paul Scholes' cross with a header pointing to the bottom corner. And at the 66th minute, Wayne Rooney scored the closure goal when the ball from Doni's save against the header of Ji-Sung Park came to Rooney's foot and in for the 2nd goal(0-2). Christiano Ronaldo, Wayne Rooney and other Manchester United players celebrates.